Ohatsutenjin-dori Shotengai is a covered shopping arcade packed with eateries, bars and other entertainments in an area of Umeda called Sonezaki. It is hard to believe these days, but once upon a time Sonezaki was a quiet wooded area and the setting for the tragic love story of Ohatsu and Tokubei, Osaka’s very own Romeo and Juliet. 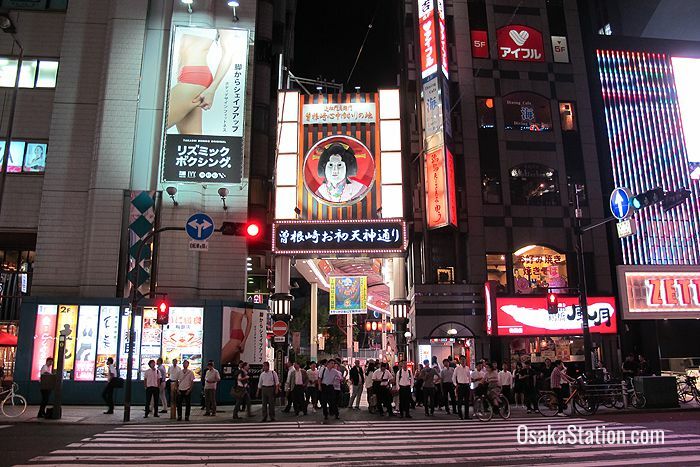 Because of this romantic association there is a famous shrine at the end of the arcade called Ohatsu Tenjin which is named after the heroine of the story, and that is also why the shopping street is called Ohatsutenjin-dori. You can read about the shrine and the romance too, in our article Tsuyu-no-Tenjinja Shrine (Ohatsu Tenjin). In this article we are mostly going to look at some of the great dining options on the street that leads to the shrine. 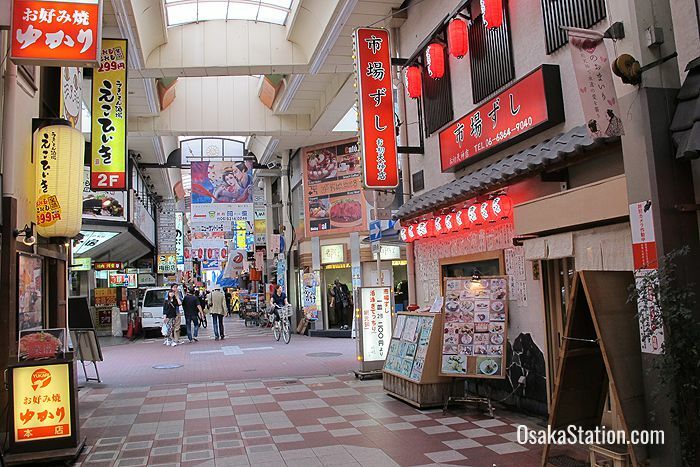 Shotengai is the Japanese name for shopping streets which are very often in covered arcades and also often located close to railway stations. 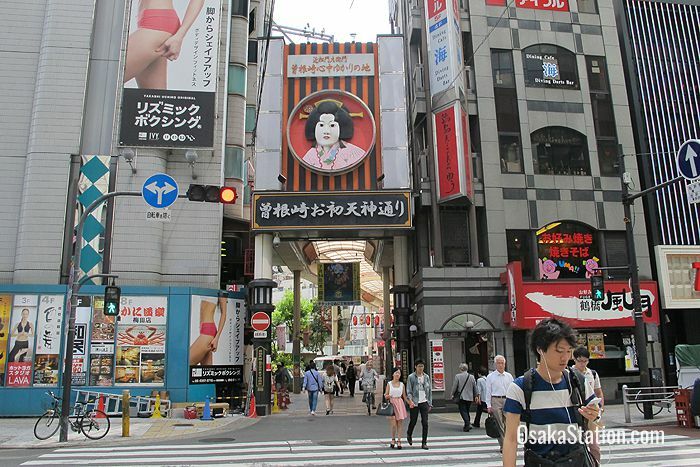 Ohatsutenjin-dori is one of the most popular shotengai in Umeda, but more for dining than for shopping. Ohatsutenjin-dori is very convenient for local office workers in Umeda who come here in large numbers for both lunch and dinner. 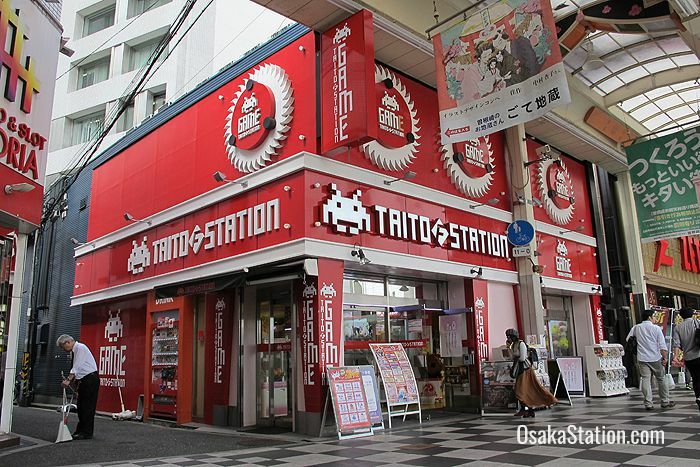 There are other entertainments along the street, such as a game center, several karaoke shops, and pachinko pinball parlours. However, in the main this is a place to eat. 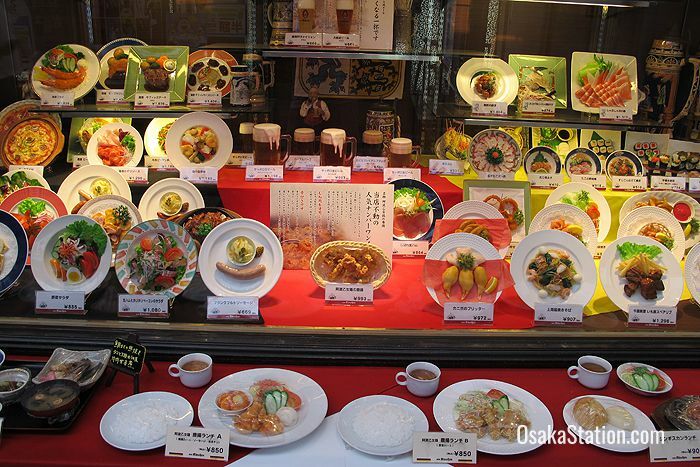 You can find all kinds of restaurants here and of course plenty of local Osaka specialties. Here are some highlights. 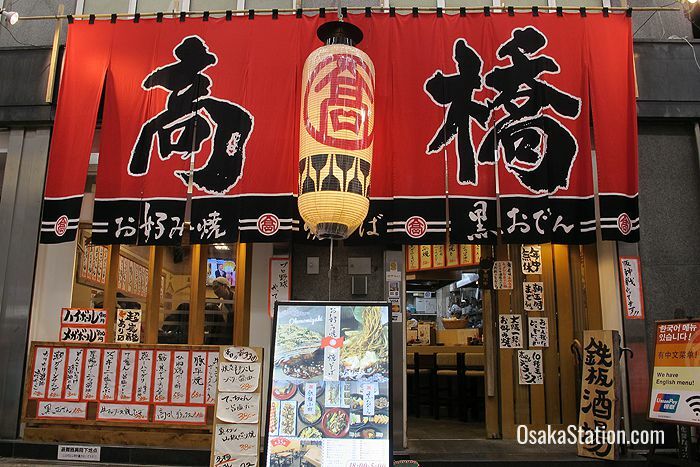 One of the best places to have lunch is Tempura Kaisen Gofuku which is located about two thirds of the way down the street, on the west side and just across from the Umeda OS Building. 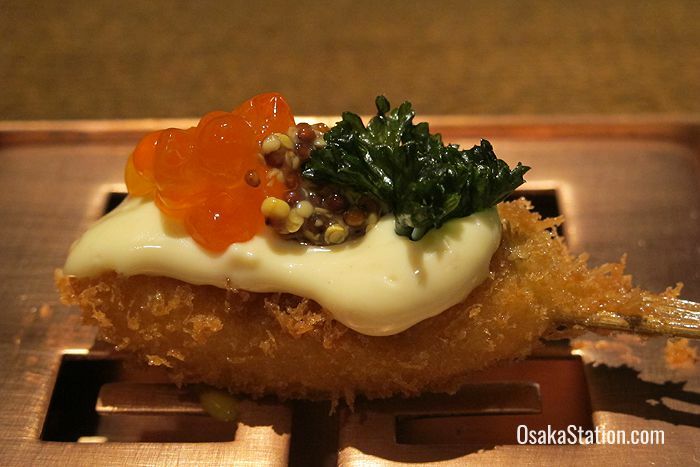 This casual eatery serves very tasty tempura: deep fried battered seafood and vegetables. The fresh seafood is taken from Tottori and Shimane Prefectures on the Japan Sea coast, and the tempura is fried in rice bran oil which is known for its mild flavor and various health benefits. The servings here are huge. Various set meals are available. A simple bowl of tendon (tempura on rice) will cost 880 yen before tax. 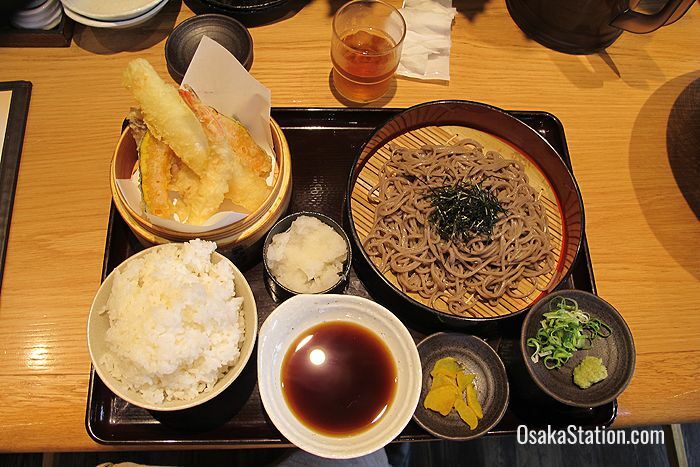 The Tenzaru set pictured above cost 954 yen before tax, and consisted of battered shrimp, squid, chikuwa fish cake, and vegetables, with rice and cold zaru soba buckwheat noodles served with a dipping sauce. You can choose small, medium, or large servings of rice depending on your appetite, with no effect on the cost of your meal. Tempura Kaisen Gofuku is open from 11.30 – 14.30 for lunch (with last orders at 14.00). Dinner is served from 17.30 – 24.00 (with last orders at 23.00) or until 22.30 (with last orders at 22.00) on Sundays and national holidays. Kushikatsu are skewered kebabs of meat, fish and vegetables which are deep fried and served with a variety of dipping sauces or flavored salt. 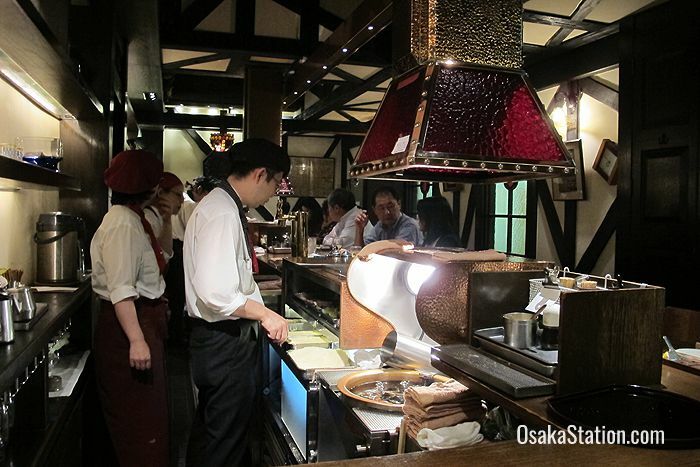 There are three kushikatsu restaurants on Ohatsutenjin-dori, but the restaurant Shiruhisa has more of a fine dining atmosphere and very elegant Showa era style interior decor. This is a good spot to have dinner. The restaurant dates from 1946 but has been renovated in recent years. The staff are very polite and will advise you on which sauce to use for each item you order. You can order a selection of kushikatsu skewers or order them one-by-one from the a la carte menu. 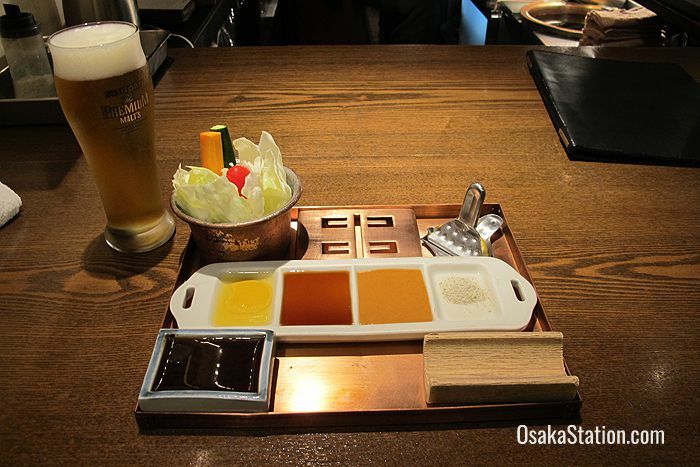 Shiruhisa is open from 17.00 – 22.30 with last orders at 21.30. Okonomiyaki pancakes are made from eggs, shredded cabbage, and yam with various toppings and are popular throughout the country. 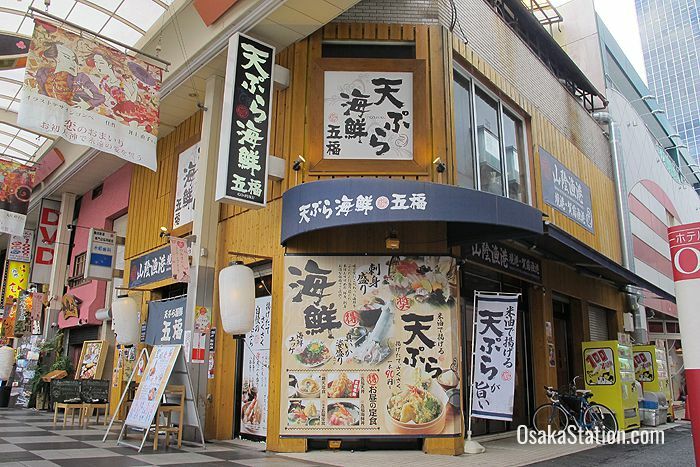 Osaka however, is particularly famous for its okonomiyaki so it is a good idea to try some while you are here. 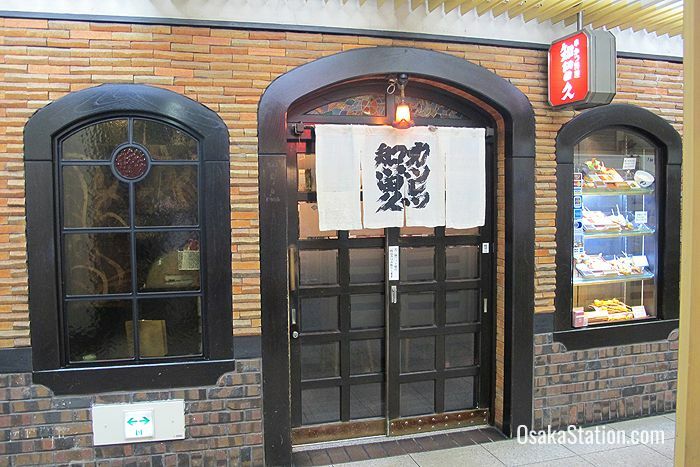 Takahashi is a well-known restaurant selling okonomiyaki, and also yaki-soba style fried noodles, and an unusual variety of oden winter soup called “kuro oden” or black oden. They also have an English menu. 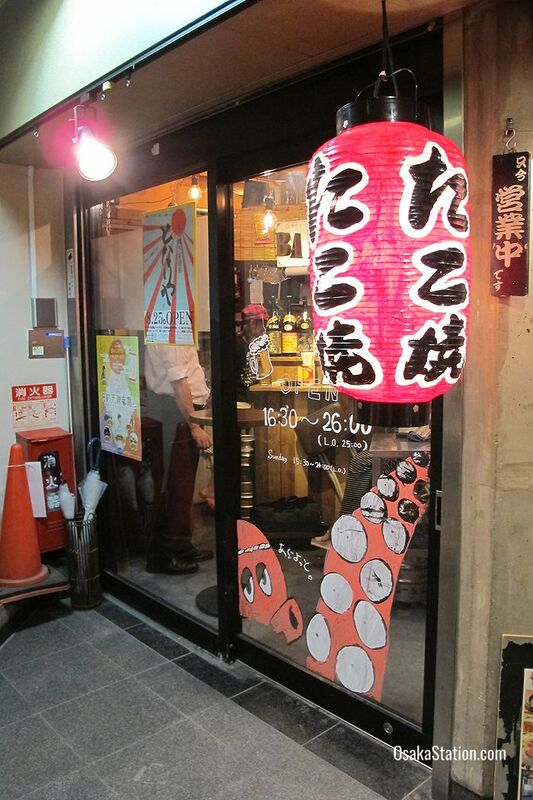 Open: 18.00 – 29.00. 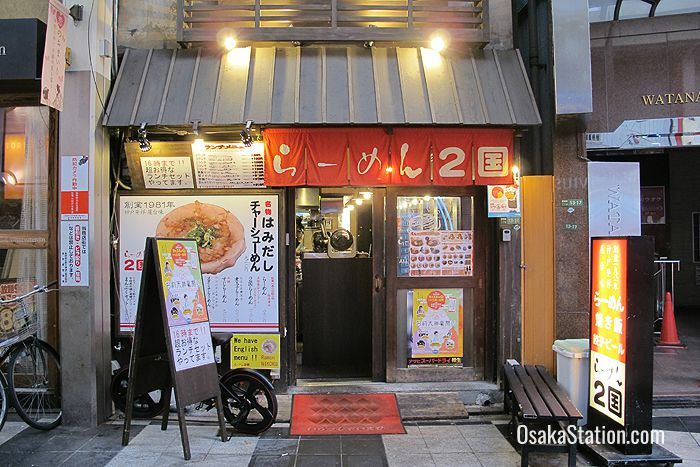 Takoyaki or deep fried octopus dumplings are a classic Osaka snack and you can find these at the entrance to the Ohatsu Tenjin Shrine in a little first floor shop called Takoyaki & Bar Soi. Open 16.00 – 2.00 am (with last orders at 1.00 am). 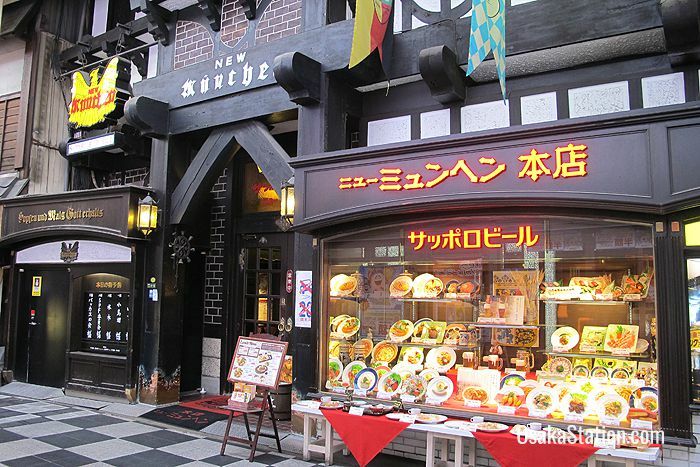 In addition to these local specialties you can find sushi restaurants, yaki-tori style char-grilled chicken, gyudon style beef on rice, curry, ramen noodles and so much more! Bar Mar French is a casual eatery serving Southern French food, with a particular emphasis on seafood and escargot. Open: 17.00 – 2.00 am (with last orders at 1.00 am). 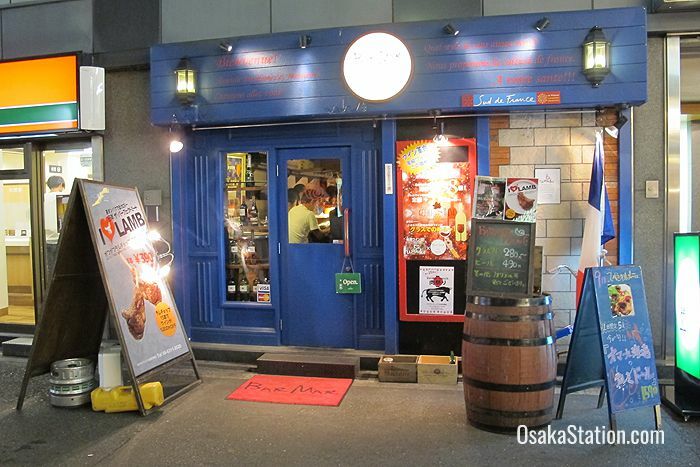 Most of the drinking venues along the arcade are izakaya style casual restaurants. There are also a number of small hole-in-the-wall type bars, but these have a small number of seats, fill up quickly and you may feel uncomfortable if you can’t speak Japanese. 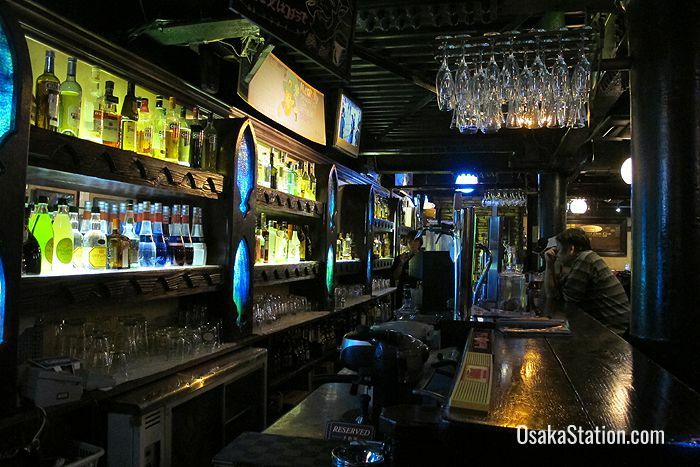 There is however, a spacious Irish bar called The Blarney Stone on the 6th floor of the Sonezaki Center Building which gets a good mix of local Japanese and international customers. Open 17.00 – 1.00 am. 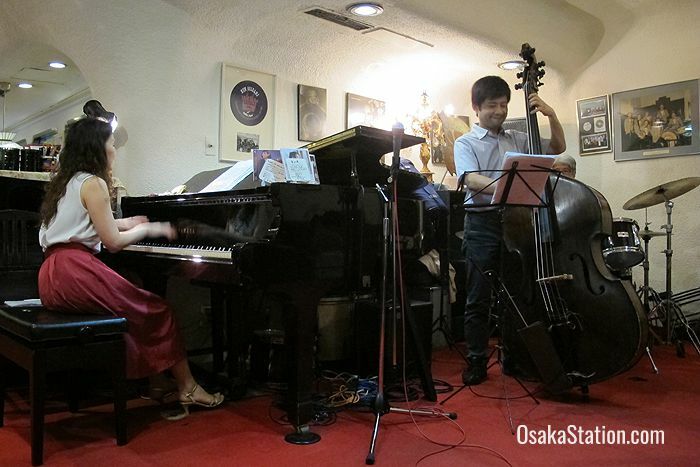 On the 5th floor of the same building as the Blarney Stone there is a bar called New Suntory 5 which has regular live jazz performances throughout the week. The bar which first opened in 1970, has both table and counter seating and has a lot of loyal regular customers. 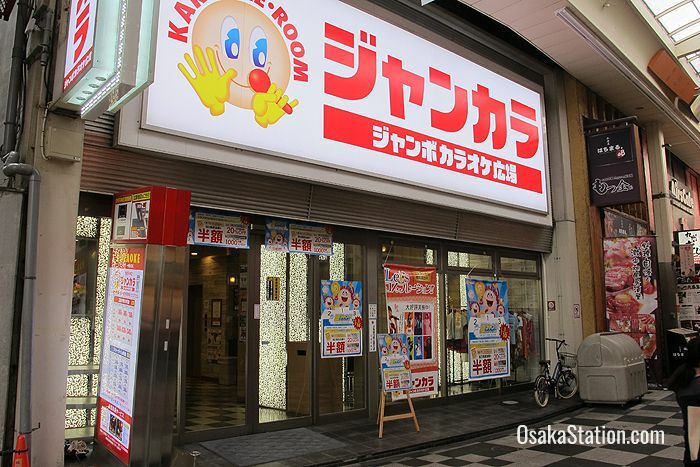 Customers should be aware though that there is a seating charge of 1,100 yen, plus an extra charge for live music of 700 yen (no extra music charge for customers under 30 years of age), and that each customer must buy one food item or snack as well as drinks. These extra charges can make it rather an expensive bar to visit. Open: 17.30 – 22.30. Live music at 19.30 – 20.10, 20.40 – 21.20, and 21.50 – 22.30. Closed on Sundays.